Golden Rave Hybrid Tomato | Gurney's Seed & Nursery Co.
Meaty as a Roma, but sweet as a grape tomato. The huge yields of these yellow tomatoes are excellent for eating fresh and for uniquely colored sauces and salsas. Resistant to cracking and disease, these plants perform well in a wide range of climates. Indeterminate. Disease resistance: FT.65 DAYS. 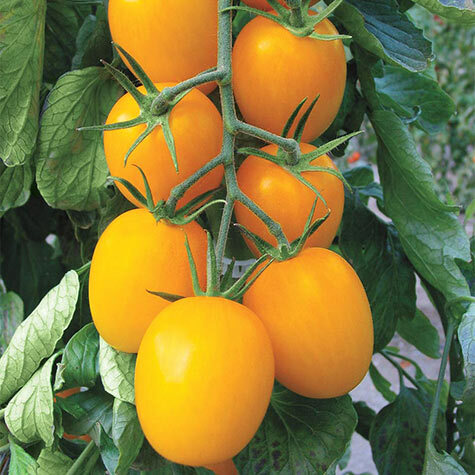 Comments: Yellow Roma type, meaty fruit with excellent flavor. Favorite of our 2010 tomato trials. Huge yields, excellent for eating fresh, but just as good for a uniquely colored sauce or salsa. Resistant to cracking. Meaty like a Roma, but as sweet and tasty as a grape tomato. Technically a Romanita type- or small Roma. Performs well in a wide climate range.